When Patricia Cooksey was beginning her riding career in 1979, she was advised to list her name as “P.J.” because many trainers would not ride a female jockey. When she retired in June 2004, Cooksey had been aboard 2,137 winners, second all-time among women riders. Cooksey also made history when she became the first female jockey to win a stakes race at historic Churchill Downs, guiding Bestofbothworlds to victory in the 1986 Pocahontas Stakes. The following year at Garden State Park, a young lady named Linda Rice won her first race as a trainer. Rice didn’t have to hide her name. Women have always been more accepted on the backside, and Rice was a natural for the profession, a third-generation horseperson. She is the daughter of highly respected horseman Clyde Rice, a former trainer who has operated a training center in Florida since leaving the racetrack. Linda Rice tried college for a couple of years, but the lure of the racetrack finally won out. Racing has been much the better because of her decision. When Saratoga closed its 2009 session Sept. 7, Rice, like Cooksey, had made history. She stood atop the trainer’s standings at one of the country’s most prestigious meetings, making her the first woman to win the trainer’s title at a major United States racetrack. It was not the first time Rice had made history at a racetrack. In 1998 she became the first woman to train a grade I winner at Keeneland, when she saddled Tenski to win the Queen Elizabeth II Challenge Cup Stakes. She had won her first grade I just a month earlier when Things Change took the Spinaway Stakes. Rice finished second in the Saratoga standings in 2007, and last year, in the Mechanicville Stakes at the Spa, she tightened the girth on the first four finishers—Ahvee’s Destiny, Canadian Ballet, Silver Timber, and Karakorum Elektra. That result should not have surprised anyone because the previous year, Rice ran one-two-three in the New York Stallion Fifth Avenue Stakes at Aqueduct with Canadian Ballet, Sweet Bama Breeze, and Noble Fire. Every August during the Saratoga meeting, the annual induction ceremony is held at racing’s National Museum of Racing and Hall of Fame across the street from the racetrack. This year’s honorees included steeplechase conditioner Janet Elliot, the first woman trainer and second female—the other being retired jockey Julie Krone—to be enshrined. Elliot has led the National Steeplechase Association’s annual earnings list six times and her runners have earned three Eclipse Awards. Of course, the success of women in racing is not restricted to the U.S. In France, fourth-generation horseperson Criquette Head-Maarek, the daughter of former trainer and leading breeder Alec Head, is arguably the greatest female trainer in the world. Trainer Gai Waterhouse has won numerous training titles in Australia, and two years ago joined her father, Tommy “T.J.” Smith, in that country’s Hall of Fame. In 1983, Penny Chenery, Allaire duPont, and Martha Gerry became the first women to become members of The Jockey Club. Since then, 11 other women have become members and there are 10 current members—Helen Alexander, Josephine Abercrombie, Ramona Seeligson Bass, Alice Chandler, Chenery, Lucy Young Hamilton, Dell Hancock, Viola Sommer, Stella Thayer, and Charlotte Weber. It would be impossible in a single column to portray accurately the importance women have played, and continue to play, in racing. 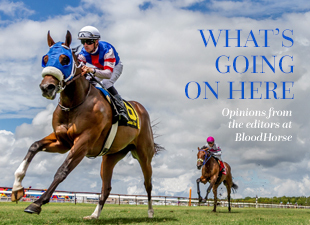 Suffice it to say it has been significant and covers every aspect of the industry: owner and breeder; trainer and jockey; veterinarian and researcher; buyer and consignor; groom and hotwalker; track and racing official. We are reminded of how special the accomplishments of females are when we watch Rachel Alexandra. Perhaps those who only have a casual interest in racing still more easily recognize the name Mine That Bird than Rachel Alexandra. But, those in the industry recognize how special Rachel Alexandra is. And Linda Rice, Janet Elliot, and P.J. Cooksey help us remember the contributions of women to the Thoroughbred industry.